The Village Team have applied to the Galaxy Hot Chocolate Fund for one of eighty five donations of £300.oo to local community good causes, and need as many votes as possible over the next week (from 3 November) to stand a chance of winning!! Please support us by voting on line and by passing on details of our bid to your friends and family, so that they can vote too! Click here to vote for the Heptonstall Village Team “Getting to Know You Tea Party bid. 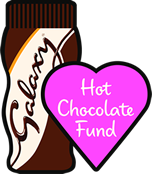 More information on the Galaxy Hot Chocolate Fund can be found here. This entry was posted in Events, Heptonstall Village Team, Local Groups news, Village Team Past Events. Bookmark the permalink.